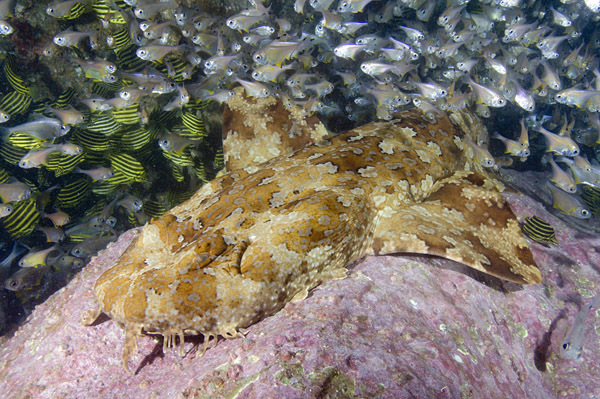 Encounter: Enormous banded wobbegongs, dwarf ornate wobbegongs, spotted wobbegongs and possibly tasseled wobbegongs. Also lots of grey nurse sharks (sandtigers), shark rays, bull rays, the occasional blind shark and various other seasonal visiting elasmobranchs. All of these animals are just hanging out at Fish Rock, a small guano covered islet not far from Southwest Rocks in New South Wales. Wobbegongs lounge around on the ledges and Grey nurse sharks hover in the gullies between them. There is also a fissure that runs right through the islet and forms a long swim-through cavern that hosts yet more wobbegongs and the occasional grey nurse. The cave is also home to a couple of gigantic bull rays. Operators: Jon Cragg is the owner/operator of Fish Rock Dive Centre. He has done thousands of dives on the rock and has a fast dive boat that can get you there from Southwest Rocks in about 20 minutes. John's dive shop is located on the main road into SW Rocks and is attached to a hotel which is happy to cater to divers. Southwest Rocks Dive Centre is another recommended operator.